Kevin Cotter thought his marriage would last forever, but after 12 years, he found his wife packing everything into her car—everything except her wedding gown, that is. 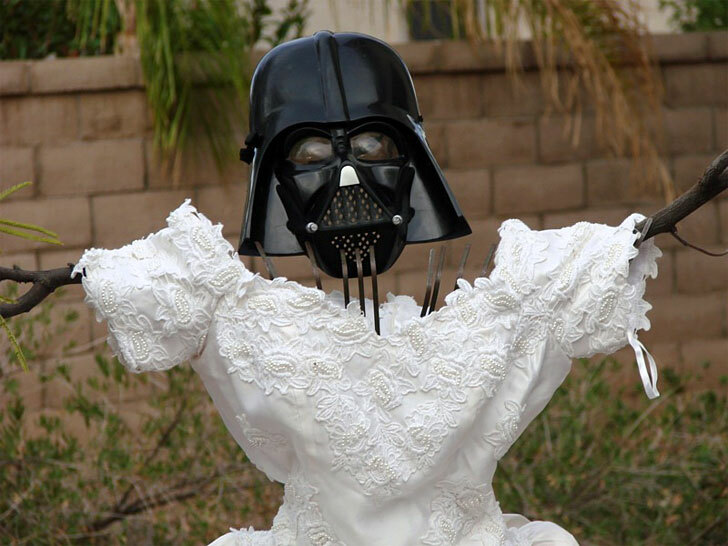 Faced with his shock and confusion, the Tuscon salesman channeled his heartbreak into a blog that recounted the many comical ways Cotter put the dress to work, including a scarecrow (above)), a pasta strainer, a wheelbarrow, and even a homemade punching bag. A book, 101 Uses for my Ex-Wife's Wedding Dress, soon followed. Click through our photo gallery for some of our favorites. Hilarity will ensue, we promise. Despite its singular purpose, the gown proved to be surprisingly durable—and versatile. Cotter knew the dress would work as a towel or drop cloth, but he wondered if it would hold up to more ambitious applications. Despite its singular purpose, the gown proved to be surprisingly durable—and versatile. Thus far, it’s withstood supported Cotter’s weight as a hammock, served as a sporting events banner, and hauled piles of weeds and garden debris from his yard to the street. He’s stuffed the dress to create a comfy beanbag for lounging, hung its incredible train from a shower rod to protect his modesty, and used its voluminous skirt as a picnic blanket. Even the crinoline has done time as both a mosquito net and fishing net. Cotter’s book may be a lighthearted way to deal with heartbreak, but his repurposing ideas are an inspiration to us all. With some imagination, the clothing we no longer desire can find new life under different circumstances, sometimes with unintentionally funny results. Hilarious! Every bride's maid who has purchased a hideous creation has heard the adage "you can use that dress again" (there is even a song...) but to actually see it in action is awesome!!! Way to go, Kevin! Using the dress as a canvas is an artful form of revenge. A white wedding dress makes the perfect camouflage in a snowscape. If broken commitments aren't enough to scare the kiddies away, tie a dress around a basketball for a frightful Halloween ghost. The crinoline makes for a perfect fishing net. Layers of taffeta serve as a dust cover for a lawnmower or leaf-blower. 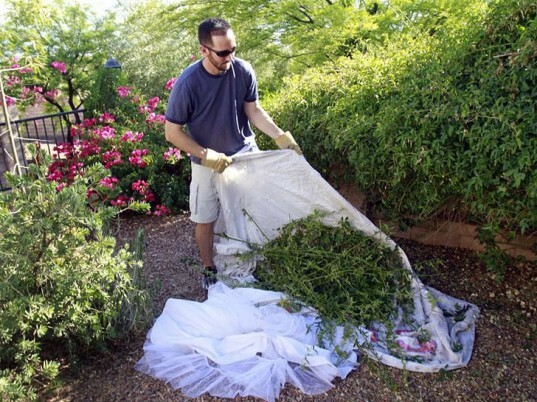 Do a little fall "wedding" by using the dress as a trap for hauling weeds and other garden debris.